Ministry of Communications & Information (MCI) has collaborated with the Ministry of Health (MOH) and the Health Promotion Board (HPB) to bring public awareness about diabetes. Together with SPHMBO, the government entities hope to empower individuals to take control of their health. The campaign aims to inspire a positive chain reaction to the young and working adults as well as older Singaporeans who have or are at risk of developing diabetes. 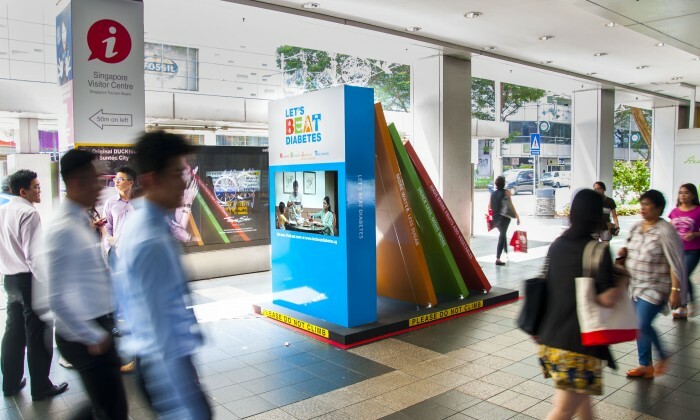 To convey its ‘Let’s Beat Diabetes’ message to Singaporeans, MCI created domino installations at various locations in town and heartland areas. The falling rows of four life-sized dominoes convey how bad habits can eventually lead to diabetes and health complications. They are set up to illustrate to Singaporeans that the choices they make now can have a cumulative effect on their future health. One side of the 1.8m-tall domino has a digital screen that features videos illustrating the “domino effect” of bad diet and lifestyle habits. To reverse the chain reaction, Singaporeans simply have to remember B.E.A.T – Be aware of the risks, Eat right, Adopt an active lifestyle and Take control of their health by getting regular health checks. The campaign has also leveraged different venues on SPHMBO’s digital inventories; from the island-wide indoor network at POSB banks to the large digital screens at HDB Hub and Vivocity. These locations were strategically selected to amplify the reach to a diverse group of audiences on the go. The campaign’s domino installation runs for eight weeks from 5 December 2016 – 5 February 2017 across multiple locations in Jurong Point, Midpoint Orchard, Big Box, White Sands, Tampines Mall, One KM Mall and more. Plus a look at what your consumers really want this Valentine's Day. ..
Mindshare partnered up with digital advertising software provider TubeMogul for its BrandPoint software. .. He will be relocating from Singapore to Kuala Lumpur next month. ..